We wanted to draw your attention to a session which we are convening at the European Geosciences Union congress in 2015. The session is co-organized by Soil System Sciences, Natural Hazards, Hydrological Sciences and the Earth and Space Science Informatics divisions. It is entitled “Communication of uncertain information in the earth sciences”. We are convening this session because we have all encountered challenges in effective communication between scientists, statisticians, managers and policy makers about uncertain information in the earth sciences. Much research in the earth sciences, including research presented at EGU, involves sophisticated statistical methods which provide probabilistic measures of uncertainty of estimates and predictions. The problem is communicating this effectively to a policy maker or a manager so that they can account for uncertainty appropriately in the decisions that they go on to make. In this session we want to focus on this problem of communication. We first convened this session at the 2014 congress. There was a well-attended and lively meeting with reports of research into communication of uncertainty, case studies in communication and overviews of particular challenges in communicating uncertainty in different sectors. There was also a strong interdisciplinary flavour to the meeting which provided an opportunity for earth scientists, statisticians, psychologists and others with an interest in communication to share insights and experience. We hope that a second session on this theme will encourage still wider participation in this discussion, and provide opportunities to report further developments, to share insights and experience, or maybe to present unsolved problems to stimulate discussion and further research. 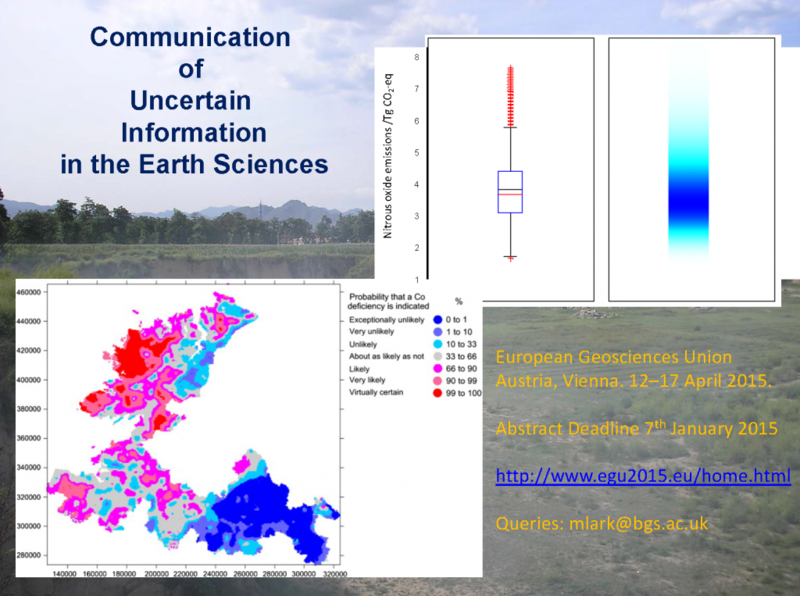 The EGU 2015 congress takes place from 12th to 17th April 2015 in Vienna, Austria. The deadline for abstract submission is 7th January 2015, and abstracts may be submitted at http://meetingorganizer.copernicus.org/EGU2015/sessionprogramme You can find our session under the Soil System Sciences programme. It is designated session SSS11.5/ESSI3.6/HS12.7/NH9.17.